Installation Tip: Always pre-drill lag screw holes to avoid splitting and cracking of the wood. 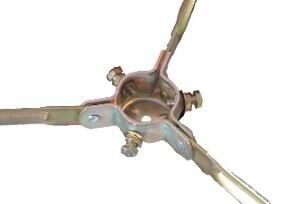 Holes should be drilled slightly smaller than the lag screws.Tripods are the most popular TV antenna mount and rarely cause any problems when installed properly using the roof sealer pads. The TV antenna tripod supports your entire TV antenna system. 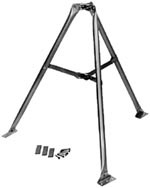 Use only professional quality, heavy duty tripods such as the, TR-36 or the TR-48. These tripods are designed to give you a lifetime of trouble free service. Roof sealing pads and lag screws are included. When install a large antenna like the Winegard HD 8200U use the 5 foot tripod not the 3 foot tripod. The 5' tripod is constructed with larger tubing and it has a wider stance so it supports the antenna better in crosswinds. The 5' tripod is the most stable rooftop antenna mount available so it's a good match for larger antennas like the HD 8200U. Proper installation is important for maximum stability. Once the rotor is installed onto the first pipe in the tripod the antenna support mast pipe is then installed into the rotor. It may be best to mount the antenna support pipe into the rotor and then install the antenna onto the pipe. I usually installed the antenna onto the pipe first and carry both the antenna and the mast pipe up to the awaiting rotor already mounted on the mast in the tripod. 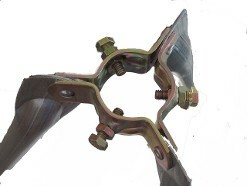 Be sure to loosen the rotor U bolts so the antenna support mast pipe can be easily slipped into the rotor mast clamps. When the antenna is already installed onto the mast pipe the pipe becomes a handle and makes it easier to carry the antenna up to the mounting location. The most important thing is to locate all power service lines before you start the project and avoid them at a distance the antenna or mast cannot come in contact with the wires. For best support and antenna rotor life the antenna support pipe should be kept shorter rather than longer. The minimum pipe lengths that will provide room to install the equipment and provide maximum support is as follows. The pipe that mounts into the 5 foot tripod tripod and supports the antenna rotor can be as little as 18 inches long. The pipe that mounts into the rotor and supports the antenna can be as little as 20 inches long when mounting the HD 8200U. When installing the HD Stacker a 30" pipe is required.